Rep. Ilhan Omar’s time in Congress is only getting wackier. 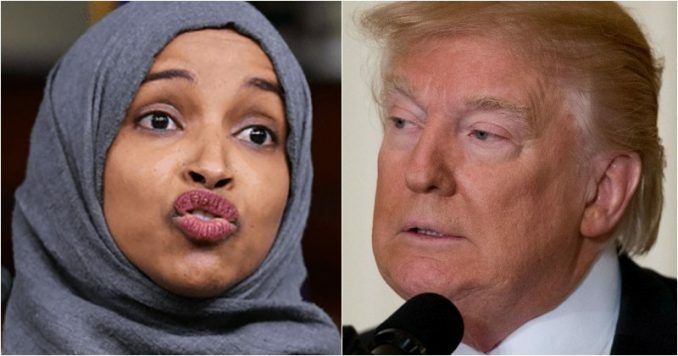 The Minnesota Congresswoman has petitioned President Donald Trump for the release of a senior leader of the Muslim Brotherhood, who Omar describes only as a “political prisoner.” Well, this didn’t go the way the beleaguered Congresswoman was hoping for. In fact, she got destroyed. You don’t want to miss this. Maybe we shouldn’t be shocked that Rep. Ilhan Omar was petitioning President Trump, who just defeated ISIS, to release one of the female leaders of the Muslim Brotherhood. But this is just an example of how unhinged the 37-year-old Minnesota Representative can be. Omar has an arrest record with the Minneapolis Police Department, who warned back in 2013 she “would continue her criminal behavior.” She intentionally misrepresented a member of the Muslim Brotherhood named Hoda Abd al-Moneim. According to the Guardian, there is a wing of the Muslim Brotherhood which is made up of female members. With the crackdown of the Muslim Brotherhood in Eygpt, the leaders turned to the female wing to carry out its dirty work. “If the last 11 months have been brutal for the Brotherhood, they have also been transformative for the women who have long operated in its shadow: the Muslim Sisterhood,” the Guardian reported. It seems that when Abdel Fattah al-Sisi became President of Eygpt in 2013 he refused to grant the Muslim Brotherhood any power. Since that time Brotherhood operatives like Hoda Abd al-Moneim have been working to overthrow him. Now, we have Rep. Omar asking for Hoda Abd al-Moneim’s release. How crazy is this? Pretty darn crazy, and we aren’t the only ones finding the Minnesota Congresswoman anything but an American patriot. “I know we aren’t supposed to question Ilhan Omar’s motives because that makes you Islamophobic in today’s simplistic political scene, but her actions continue to bewilder,” reports Red State. Foreign Policy Expert Jordan Schachtel put Rep. Omar’s first allegiance to anti-American causes all in perspective by explaining the deep ties this so-called “political prisoner” Hoda Abd al-Moneim has to the Muslim Brotherhood. Well, one of those Muslim Brotherhood-tied campaigners appears to be Rep. Omar. We can only say “appears to be” since we cannot prove the Minnesota Congresswoman is tied to the Muslim Brotherhood, but we can say she is definitely campaigning to get Hoda Abd al-Moneim a get out of jail for free card. Omar, why would the American president help a Muslim Brotherhood terrorist get out of an Egyptian prison? So she can help kill Sisi? No one wants her freed but terrorists. And you. Why don’t you advocate for the journalists locked up in Turkey? Iran? Gaza? Omar’s lone tweet asking to free a Muslim Brotherhood leader may be the last straw in her extremely controversial career. She has attracted so much attention from the GOP that come election time the Congresswoman will be faced with a massive effort to unseat her. Rep. Omar took the oath to “protect and defend” the United States from “enemies foreign and domestic,” but she seems to have conveniently forgotten that part. It’s inconceivable that she ended up in Congress on a lark. And it should be scary to every American that she sits on the powerful Foreign Affairs Committee where she has access to top-secret and highly classified documents. So, for all these reasons, it should be priority one for patriotic Minnesotans to do all they can to make sure her time in Congress comes to a screeching halt in 2020.